There is something wonderfully comforting about roasting a chicken, and sitting down to share it with family, and whichever friends happen to be over. It is a very simple meal, that always fills me, and our family, with contentment and pleasure. Set the chicken in a roasting pan and stuff the cavity with the garlic, rosemary and 2 of the orange halves. Juice the remaining 2 orange halves. Rub the olive oil over the chicken. 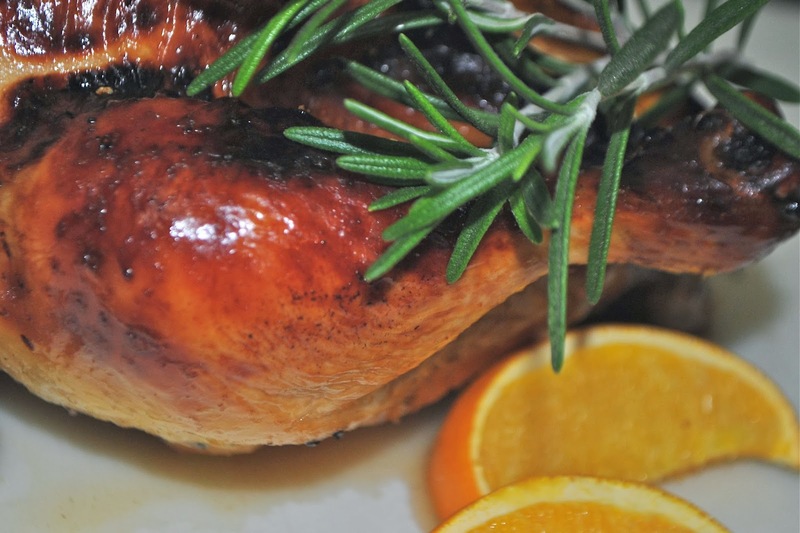 Pour the wine and orange juice over the chicken, drizzle on the honey and season with salt and pepper. Roast the chicken for 20 minutes. Add 1 cup of the broth to the pan, cover the pan with foil and reduce the oven temperature to 375F. Roast the chicken for 40 minutes. Add the remaining 3/4 cup of broth to the roasting pan. Cover and roast for 50 minutes longer, or until a thermometer inserted in an inner thigh registers 165F. Transfer the chicken to a carving board and let rest for 15 minutes. Strain the pan juices into a saucepan and skim the fat. Carve the chicken and serve with the pan juices. I was shocked when I realized we had a week where our family wouldn’t sit down for dinner at home together one time. 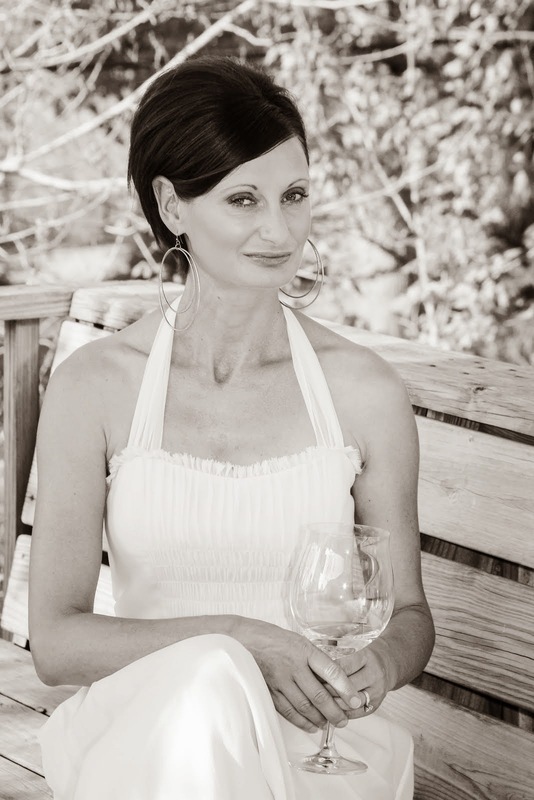 Evenings were busy with gatherings, fundraisers, and dinners – either I had plans, my husband and I were going out, or we grazed at home but at different times, sitting around the kitchen island or standing. 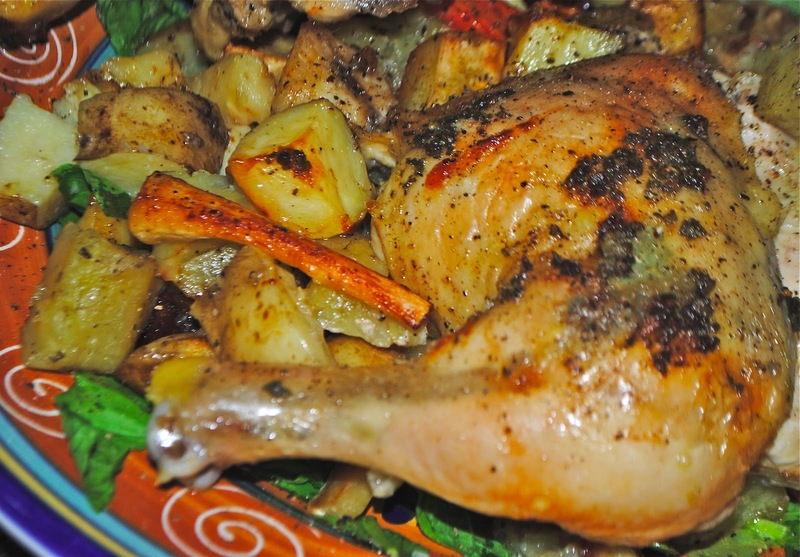 I was able to cook dinner on one occasion, but I left my husband and children enjoying the Roasted Chicken with Warm Bread Salad, while I met friends out. Generously season chicken cavity and skin with salt and pepper. Loosen skin on breast, slide thyme and bay leaves under skin. 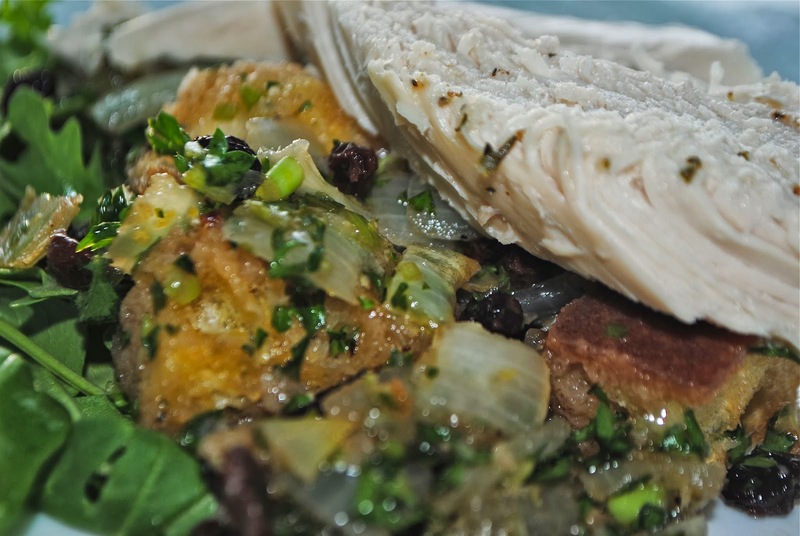 Put a sprig of thyme and the chopped apple into the chicken cavity. Place chicken in roasting dish, drizzle with 2 tablespoons of olive oil. Transfer baking dish to the oven, bake until thermometer inserted into chicken reads 170F, about 1 hour and 45 minutes. Transfer chicken to a carving board, cover loosely with foil. While the chicken is resting, toss bread cubes and onion with 2 tablespoons of olive oil, place on a foil lined cookie sheet and bake for 10 to 12 minutes. Meanwhile, combine currants, vinegar, 1 tablespoon of olive oil and sugar, let stand 15 minutes. Add bread and onion, along with green onions, parsley and lemon zest. Toss until the bread has absorbed most of the liquid. Season with salt and pepper. Arrange a bed of arugula on plate, top with bread salad and chicken pieces. I was very excited to gather together and spend time again with the wonderful ladies who lunch. 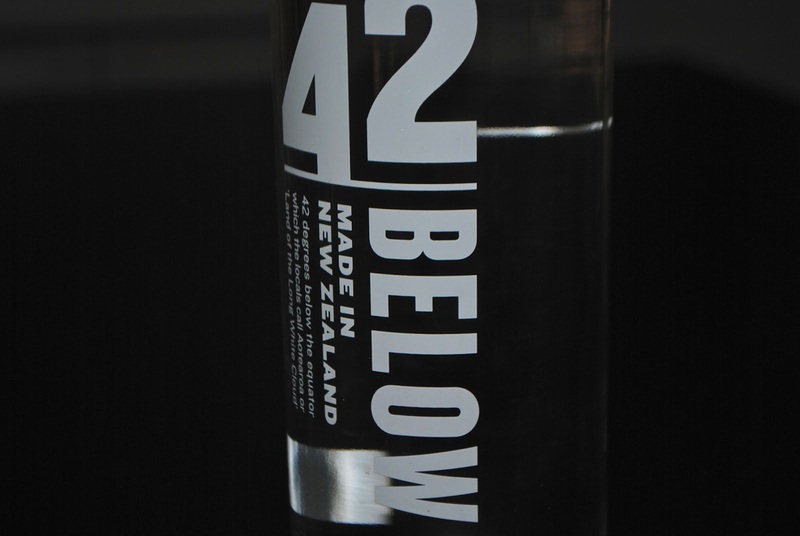 I chose a New Zealand theme – preparing some of the dishes I grew up with and some that were new to me. Everything everyone contributed was fabulous – food and conversation, resulting in yet another joyful occasion for the taste buds and the soul. Fill glass with ice. Add vodka and top with apple juice. 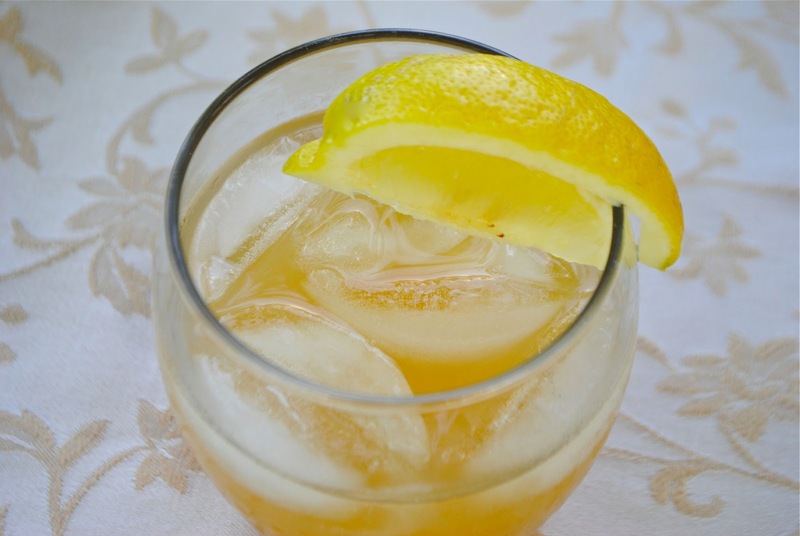 Stir and garnish with lemon wedge. Lightly grease 1 to 2 oven trays. Combine sausage, onion, thyme parsley, ketchup and breadcrumbs in a bowl, mix well. Spread out pastry sheets and using a rolling pin, roll them until they are thin. 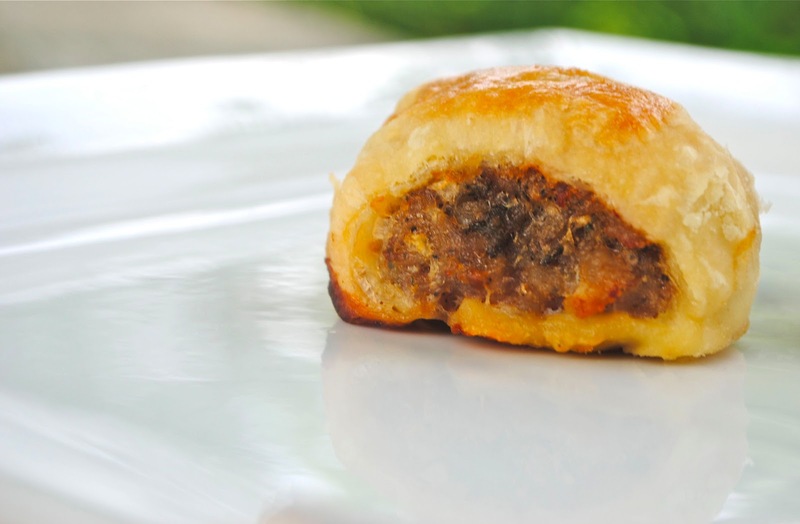 Place the sausage mixture down the center of the pastry. Brush edges of pastry with lightly beaten egg, fold over sides of pastry to enclose mixture. Trim ends of rolls, and cut into 2 inch long pieces. Repeat as necessary. Lightly brush rolls with remaining egg, cut a couple of slits into the top of each roll. Bake in a moderate oven about 20 minutes, or until lightly browned and cooked through. Toss diced kumara in oil and season with salt and black pepper. 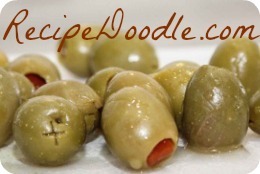 Place in a roasting dish and scatter with rosemary sprigs. Roast for 25 to 30 minutes or until tender. While kumara is cooling, increase temperature of oven to 200C and roast cashew nuts in a separate dish for 8 to 10 minutes. Toss after 5 minutes so nuts become evenly colored. 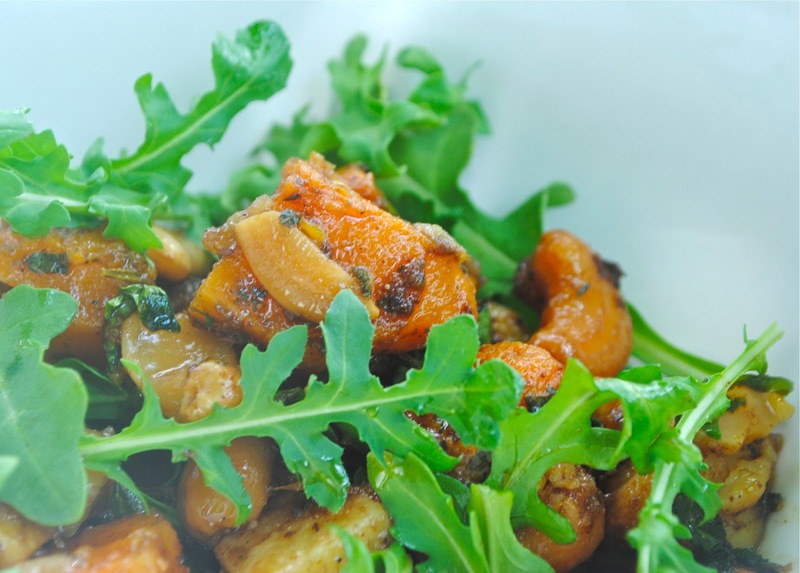 Add cooled cashews to the kumara, and toss with chopped mint and arugula. Make dressing by blending all ingredients in a blender. Add about half the dressing to kumara mixture and stir lightly. Add more dressing to taste. Blanch 1/3 cup basil leaves in a small saucepan of boiling water for 30 seconds. Drain, then transfer basil to a bowl of iced water to cool. Drain, squeeze out excess water from basil. Puree basil with corn syrup in blender. Cover and chill at least 2 hours or overnight to allow flavors to develop. Bring basil syrup to room temperature before serving. Position rack in the center of the oven and heat to 275F. Draw six 2 1/2 inch circles on parchment paper, then invert onto baking sheet. Using electric mixer, beat egg whites in a large bowl to soft peaks. Gradually add 3/4 cup sugar, beating to medium firm peaks. Beat remaining 1/4 cup sugar and cornstarch in a small bowl. Gradually beat sugar-cornstarch mixture into meringue, beating until very stiff. Beat in white wine vinegar. Fold in peppercorns. Divide meringue between circles, spread to fill completely. Bake until outside is dry, about 25 minutes. Turn oven off and open door slightly. Let meringues cool in oven until completely dry, about 1 hour. Place cream and sugar in a medium bowl. Scrape seeds in from vanilla bean. Using electric mixer, beat cream to soft peaks. 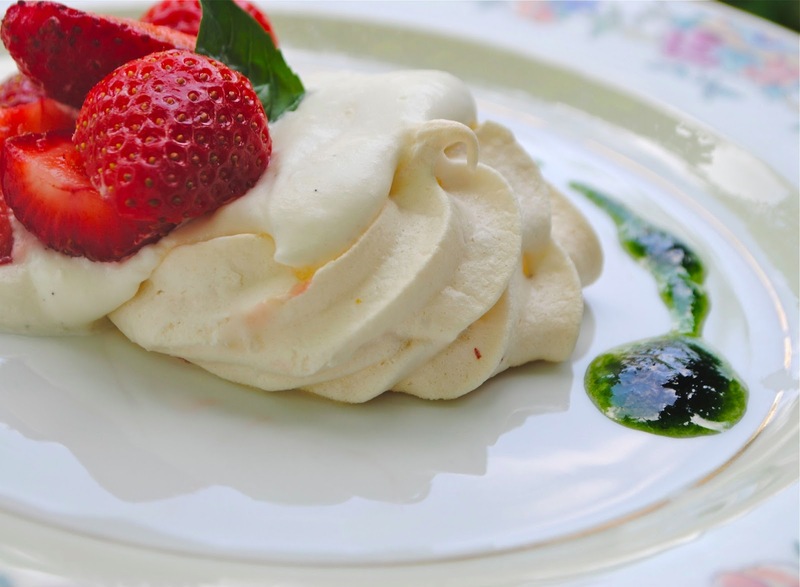 Place a meringue on each plate, top with a generous amount of vanilla cream. Top with strawberries and fresh basil leaves. Drizzle basil syrup on plate.